The majority of Burials are carried out in either Lawn or General Cemeteries, however it is possible in certain circumstances have a burial on Private Property. At Bevan Douglas Funerals we are open to all options and discuss these with the family at the time. In most cemeteries it is possible to have a double interment in the one grave or side by side burials allowing for loved ones to be together. Most older General Cemeteries have sections where burials can be carried out according to the religious beliefs of the deceased. Lawn Cemeteries are normally not divided into sections. At Lincoln Grove Memorial Gardens and Crematorium where our office is situated there are also family burial plots allowing for 2, 4, 6, or 8 burials in the one area for a family. Crypts are also an option in the Cities and we at Bevan Douglas Funerals are also able arrange these if required. We have the facilities to broadcast the service and play music at the graveside. 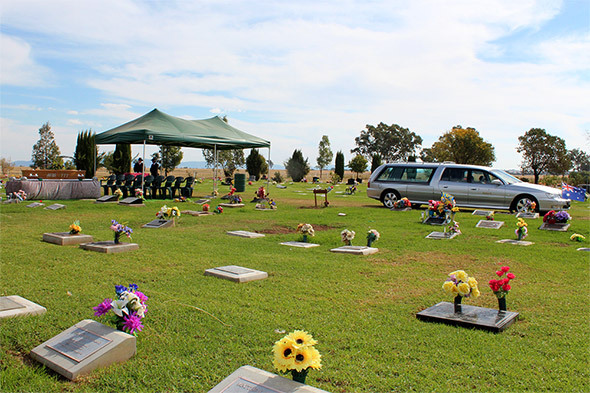 We have seating and canopies for the convenience of the family at the graveside. All these requirements will be discussed with our arranging officer at the time of the meeting with the family. Costs and quotes are also given at the time.